Who and how is using forged SSL certificates worldwide? 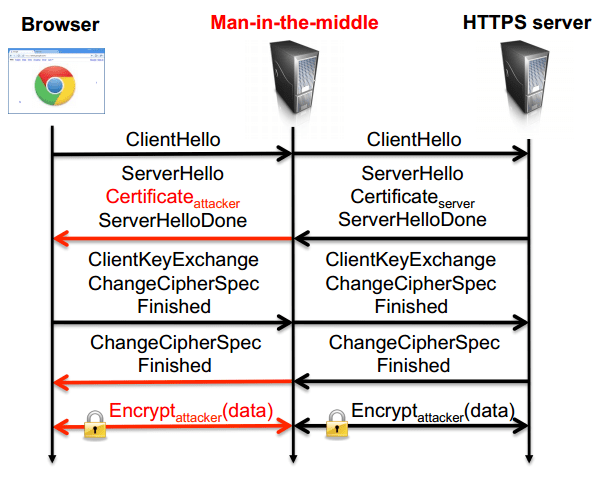 Who is abusing of forged SSL certificates in MITM attacks worldwide? 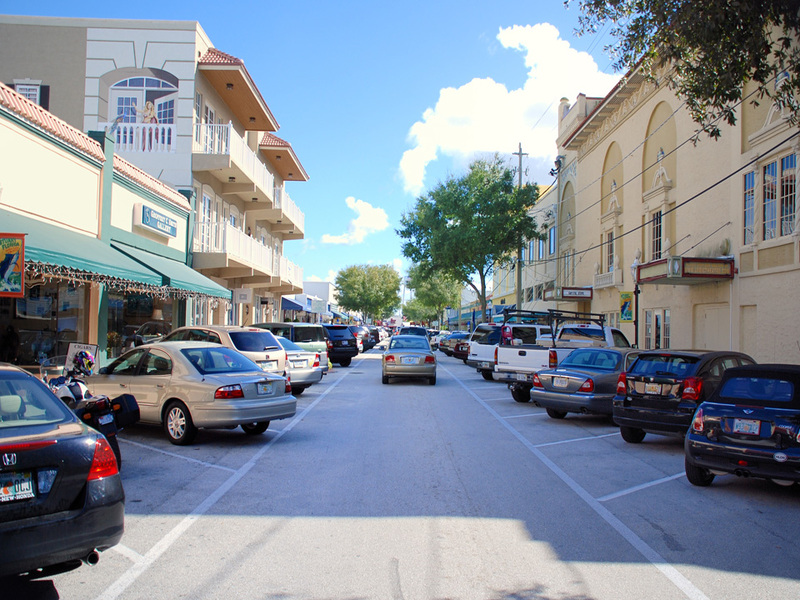 A team of researchers implemented a new detection technique to detect the abuses. A team of researchers at Carnegie Mellon University and engineers at Facebook have designed a detection technique for man-in-the-middle attacks over SSL on a large-scale. They analyzed the data extracting useful information, including the data related to digital certificates presented, about the methods used the attacks. The researchers analyzed nearly 3.5 million SSL connections made to Facebook during a four-month period started in December 2013. They discovered that 6,845, corresponding to 0.2 percent of all connections used fake SSL certificates with the intent to syphon data. This data is just related to Facebook, this means that something quite similar is happening for connections to other popular websites. It is a common practice of cyber criminal ecosystem to use fake SSL certificates for bogus websites impersonating legitimate web services like e-commerce, payment platform and social networks. The attackers usually use self-signed digital certificates or stolen certificate that is accepted as valid by most browsers. (0:2%) of them were forged SSL certificates” report the paper related to the research. Principal browsers display a warning message when encountering errors during SSL certiﬁcate validation, but users anyway can decide to proceed. This is the typical scenario for fake SSL connections which triggers a certiﬁcate warning, mostly caused by server mis-conﬁgurations, but the alert is often ignored by users that trust forged SSL certificates. In this scenario, an attacker can impersonate any legitimate website performing an SSL man-in-the-middle attack in order to eavesdrop encrypted communication. 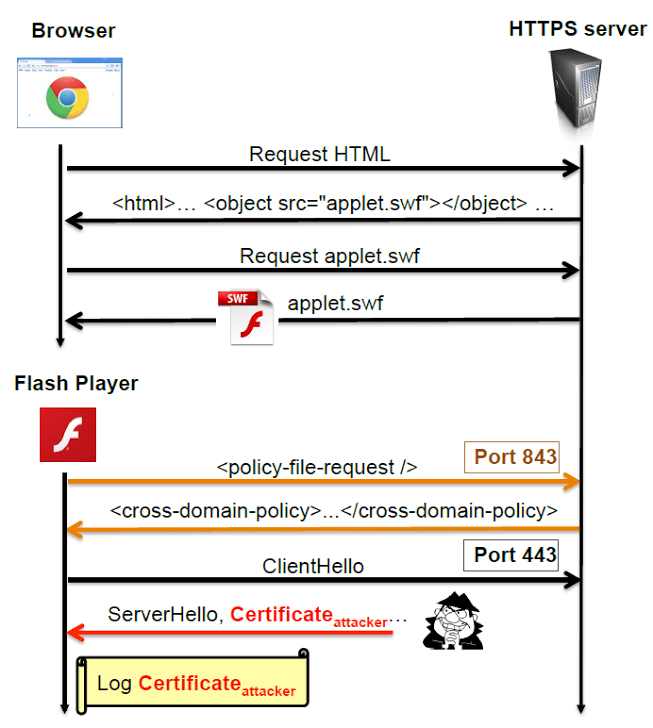 In the following image the website loads a client-side applet, that performs the SSL handshake over a Flash-based socket connection to observe SSL certificates. On the other end attackers may restrict Flash-based sockets by blocking the socket policy request (for example, whitelisting TCP ports 80 and 443 to only allow web trafﬁc), thus not allowing the Flash Player to retrieve a valid socket policy ﬁle from socket policy servers (over port 843) used by researchers. Attackers use to forge SSL certificates with name of legitimate issuer organizations, such as VeriSign, Comodo. As described in the study, many organizations issue forge certificates for their operations like Antivirus (e.g. Bitdefender, ESET, BullGuard, Kaspersky Lab), Firewall and Parental Control Software. counts are not representative of the general antivirus usage share of the website’s users, since SSL interception is often an optional feature in these products. However, if any antivirus software enabled SSL interception by default, we would expect a higher number of their forged certiﬁcates observed. The researchers also noticed self-signed digital certificates generated by malicious code, it is the case of a digital certificate named as ‘IopFailZeroAccessCreate’, which was generated by some malware and using as name of Certificate issuer VeriSign Class 4 Public Primary CA. “This was obviously a malicious attempt to create a certiﬁcate with an issuer name of a trusted CA. These variants provide clear evidence that attackers in the wild are generating certiﬁcates with forged issuer attributes, and even increased their sophistication during the time frame of our study.” said the researchers. 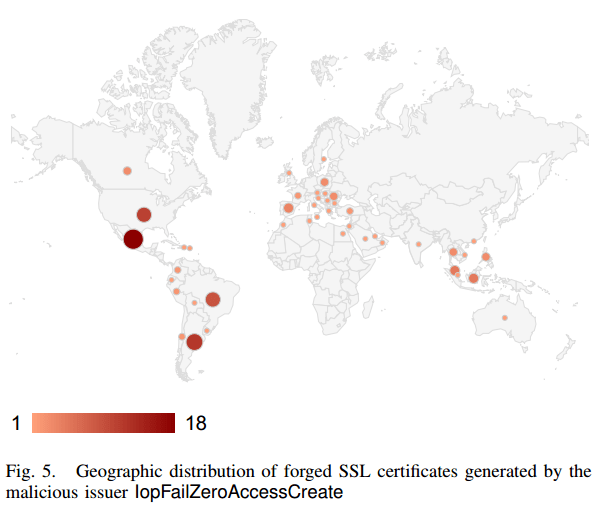 Malware forges ‘IopFailZeroAccessCreate’ digital certificates were discovered 112 man-in-the-middle attacks in more than 45 different countries, mainly United States, Mexico and Argentina. The paper suggests different mitigations methods that browser vendors could implement to mitigate the cyber threat, including the adoption of HTTP Strict Transport Security, Public Key Pinning, TLS Origin Bound Certificates, and the validation of certificates with notaries.